The National Education Association’s Read Across America is an annual reading motivation and awareness program that calls for every child in every community to celebrate reading on or near March 2, the birthday of beloved children’s author Dr. Seuss. 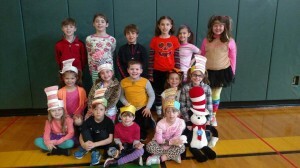 Students in grades kindergarten through fourth grade at Indian Mills Elementary School expressed their love of reading through a poster contest depicting their favorite Dr. Seuss books and characters. The winners pictured here will receive books from the Shamong Township Education Association.